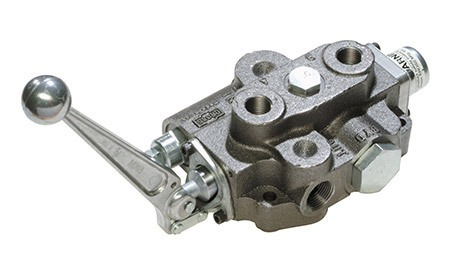 The Cross SBA series hydraulic control valve is a 3-position, 4-way valve in 1,2 or 3 spool versions with float available. The SBA series features NPTF ports and the SBA-ORB has SAE (ORB) ports. The SBS series has 12-volt solenoid (3-position, 4-way). Fully balanced select-fit honed spools with excellent metering characteristics give maximum load holding capability and long life. *For operating double-acting hydraulic cylinders or a reversible hydraulic motor.